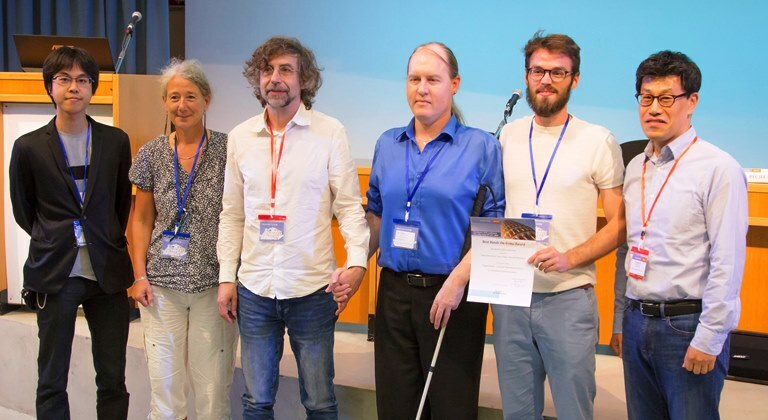 HaptiComm, a Tactile Stimulation Device for Deafblind Communication, won the best hands-on demonstration award at the Eurohaptics 2018 international conference in Pisa. 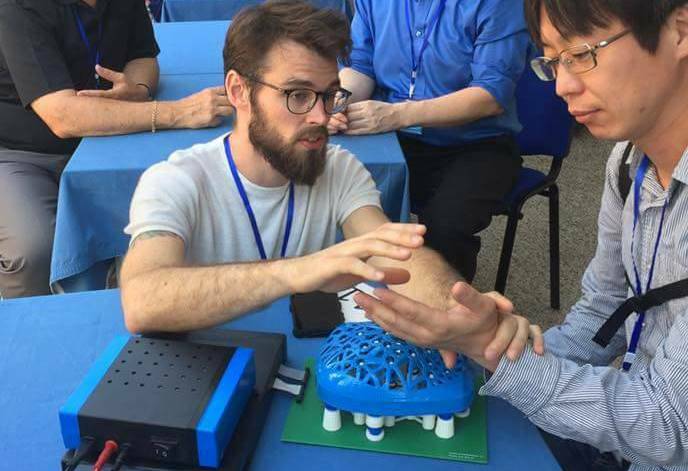 This machine-mediated technology capable of reproducing formal Deafblind communication techniques with a minimal learning curve was presented before 48 finalists participating in the event on advances in human-computer interaction organised by Professor Antonio Frisoli from Sant’Anna School PERCRO Lab. HaptiComm is a device created for Deafblind individuals and offers direct speech to Haptic language translation at speeds up to 12-14 actuations per second. 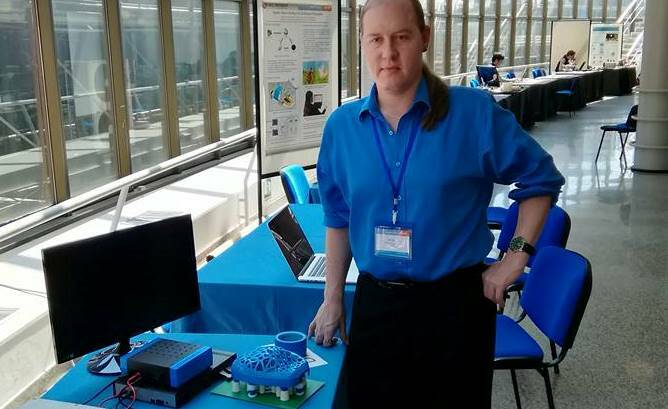 Sven Topp, a deafblind researcher from Australia worked with Vincent Hayward (University of London) and Basil Duvernoy (post-graduate fellow at Sorbonne University) on this tactile actuator based on a conventional electromagnetic motor, which is carefully configured to meet the requirements of communication by tactile spelling. They created a more ergonomic device with a keyboard entry that directly translates into a pattern on the hand. The great benefit is that there is no learning curve, since the haptic language is identical to the language Topp uses with his interpreters converting speech and text into tactile stimuli. For deafblind individuals, the absence of visual and auditory communication channels can prevent meaningful interactions with the people and world around them. This tactile stimulation system for producing nonvisual image patterns yields pulsatile flux directed to the user's skin throughout a 3D tactile plotter and it is also able to produce vibratory Braille, LORM and Molassi alphabets (among other possibilities) and runs through Google voice assistant. 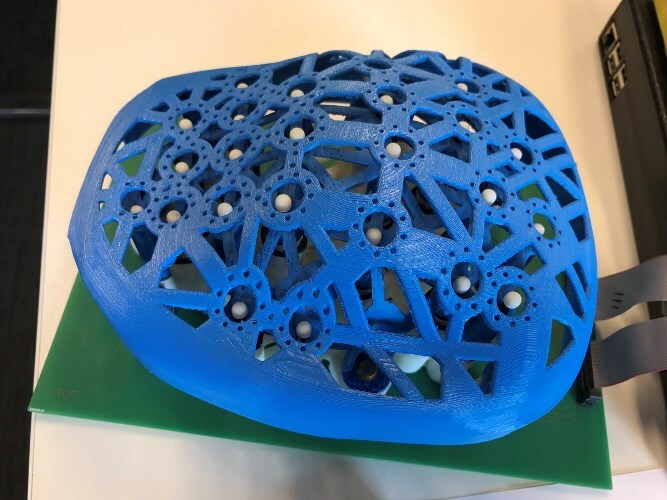 Google Faculty Awards to Vincent Hayward and Sven Topp supported the research on the HaptiComm device. Basil Duvernoy was awarded a post-graduate fellowship by Sorbonne University. HaptiComm will now head for Benudorm, Spain, for the World Federation of the Deafblind General Assembly and Helen Keller International Conference.